I am immensely proud of my students’ work during this Guided Inquiry Unit. For my final post, I wanted to share a few things that warmed my teacher heart. My goals for this Unit have always been to increase student engagement and scientific discussion in my classroom. This Guided Inquiry unit hit the nail on the head. As students began their research, they were constantly running up to my desk or stopping me as I meandered about the classroom with a “OMG Mrs. J did you know…?”. One student brought to my attention (long before I found it on my own) the article of an astronaut whose DNA is now different from his identical twin because of space travel. 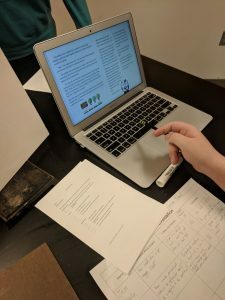 Since we knew that the research my students would be attempting would be very high level, we made sure students were looking at other resources for information, such as: videos, literature, podcasts, and artwork. 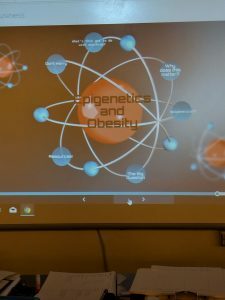 One of my students cited A Brave New World by Aldous Huxley in her research as an insight to what could go wrong if we slip into genetic modifications. I was blown away by this! 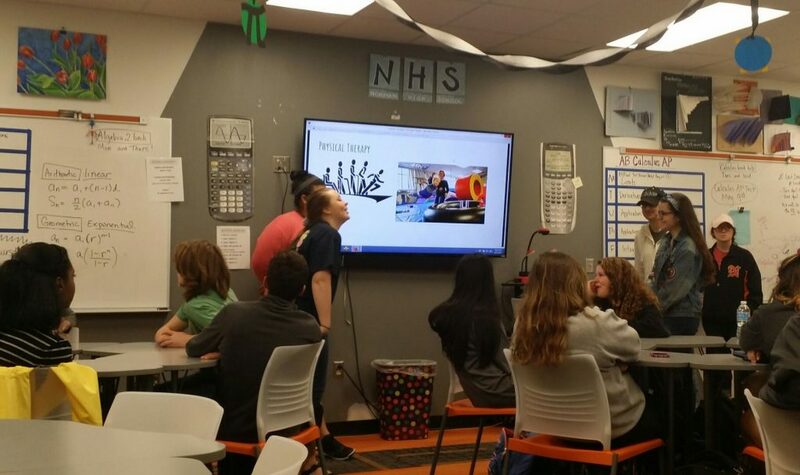 Originally “powerpoint” was not on my list of approved projects, however, this student did a TED Talk style presentation and I just could not say no to that!! Our Share phase was probably the day I was most proud of. To present our research, I decided to approach it as a gallery walk. What I enjoyed the most were the exchanges I saw between students when they visited with each other. Students had debates about the ethics of GMOs, giving each other praise and being genuinely curious about what others learned. I heard such great conversations as I walked around, but I didn’t stop since I knew they wouldn’t talk if I stood there. Hearing them speak with knowledge and confidence put a huge smile on my face and sent me skipping down the hallway. 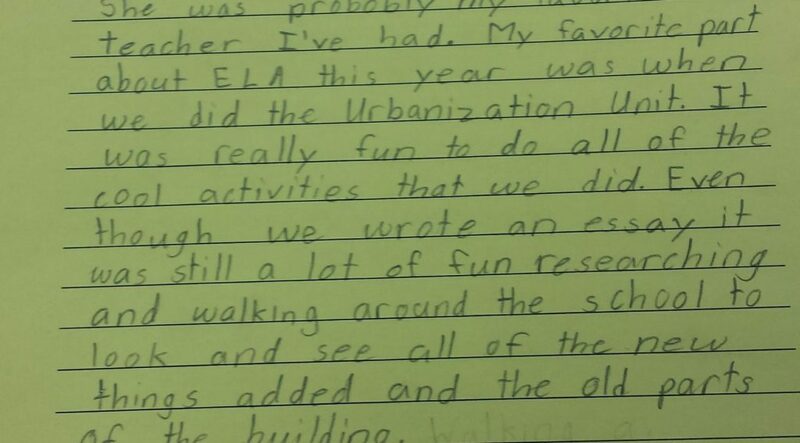 I loved watching my students grow during this process and become excited about research. They all recognized that it is difficult but extremely gratifying when they find what they needed. As I write this, I am sitting in the Oklahoma House of Representatives hoping and praying our schools get funded so I can get back to the students I miss and the job I love. Thank you for letting me share my GID experience with you!! How does GI look in Math? First, the math brained people that we are had to map out the unit and create an assignment sheet that reflected the GI stages. This gave us a better idea what each day would be like. Chapter 11 Assignment Sheet 2017-2mvemvs We knew that the students would be coming up with their own questions but were unsure of what they would be. We had a few thoughts in our back pocket but wanted to be as open minded as possible so that the ideas came from the students. Second, we decided that we would meet after school on the day that the students created their questions to help each other out with the following days’ plan. When we met the second time and we searched through the questions, there were some common themes coming out of the post it notes. 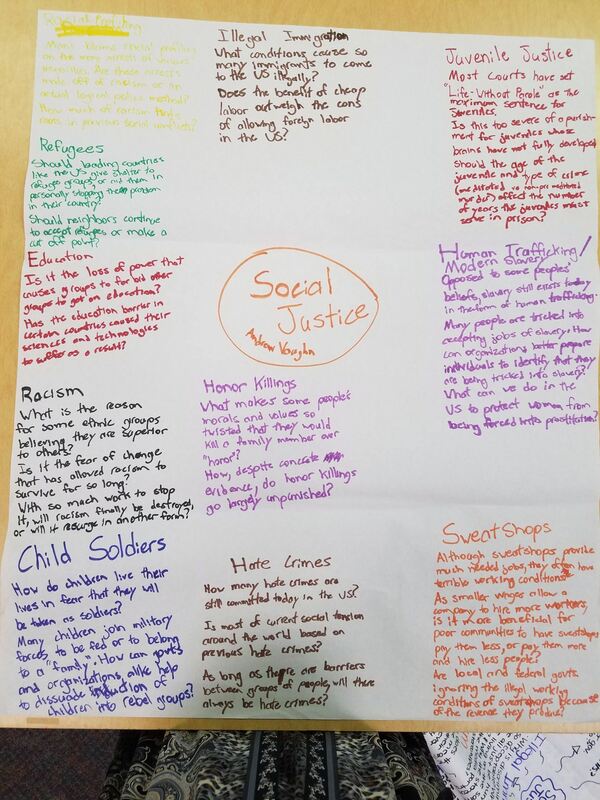 We each decided to group up the common themes that were specific to our classes. In my class, it worked best to create 5 groups, as you will see on the attachment, which also worked best physically in my classroom. Guided Inquiry Explore Results-2bujvwc When the students came in the next day, I talked through the 5 common themes and then let the students choose which one of the 5 groups interested them the most. 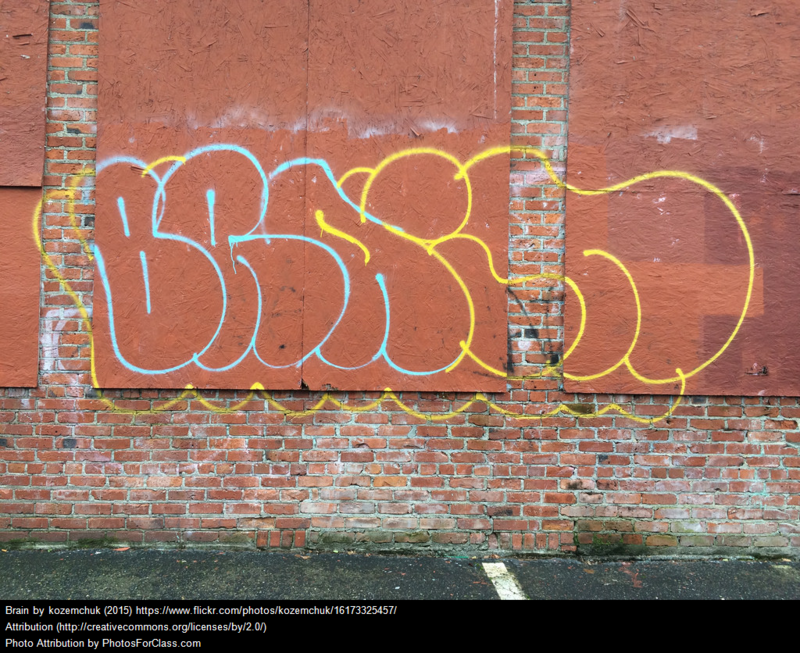 As a group, the began to explore deeper about that specific theme. Third, we let the students take the led. They gathered more information about their topics. Each class created their own rubrics on how they wanted to present their findings. 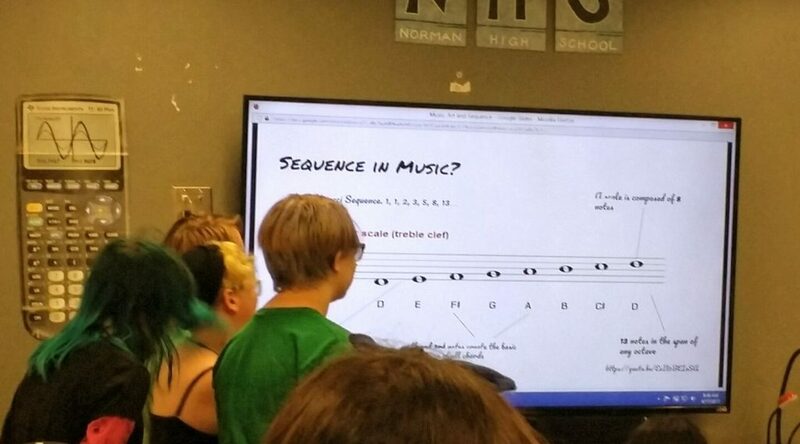 Example from 1st hour: Sequences and Series Presentation Rubric 1st hour 2017-1b4xeb8 They created amazing presentations and shared them with the class just wonderfully. 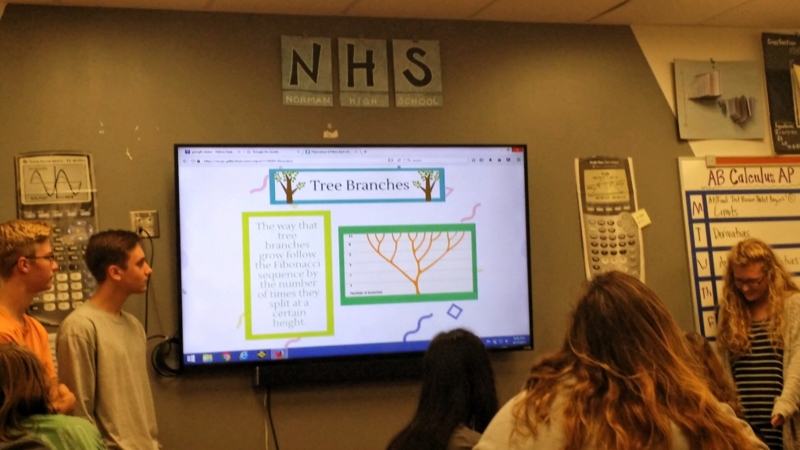 I was more than impressed with the results both of the quality of the presentations, but also with how well students worked together. (I will share some reflections from both myself and students in the next post) At the end of that day, I left school feeling GREAT! Enjoy some pictures of their wonderful presentations. 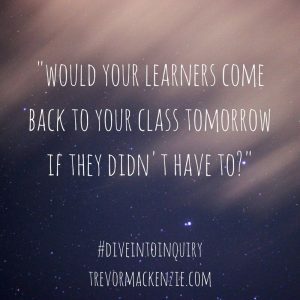 Since our staff started the year with the understanding that the Guided Inquiry Process was the way we were going to structure our learning through research for the entire year, there was never any turning back. For those who had not yet been through formal training there were times that we dipped into the process without developing a complete unit. Students had opportunities to get excited about a topic through Open, develop a common vocabulary through a rich immerse activity, or explore an area of interest in an inquiry circle. As these small steps were successful, there was much more interest in developing entire units to address concepts with students. They saw how much more engaged students were under this process. Our teachers immediately valued the ownership students had of their work. One fifth grader in particular had spent a previous unit sitting with arms crossed refusing to work. When she had the power to ask her own questions she was fully engaged. Our fourth grade teachers implemented a wave unit. When we went to form inquiry circles it just happened that most of the special education students ended up wanting to focus on the same area. We took notes using Popplet.com. They created a web to connect their areas of interest. At the end of one session we zoomed out and a student proclaimed “We know all that?” Jaws dropped a bit as these students realized how much they had learned and came to understand that they had valuable contributions to the larger group’s understanding of waves. Seeing these students thrive who previously may have floundered would have been enough of a selling point, but we consistently saw added value across all demographics. All students were challenged to grow at some point during the process. Thanks in large part to the efforts of our principal, by the end of the first week of school all staff had embraced the idea of Guided Inquiry, by mid year we were engaging students with units across all grade levels, by the end of the year we had a staff that lived and breathed Guided Inquiry. Our practice is more than just units of study in a framework. 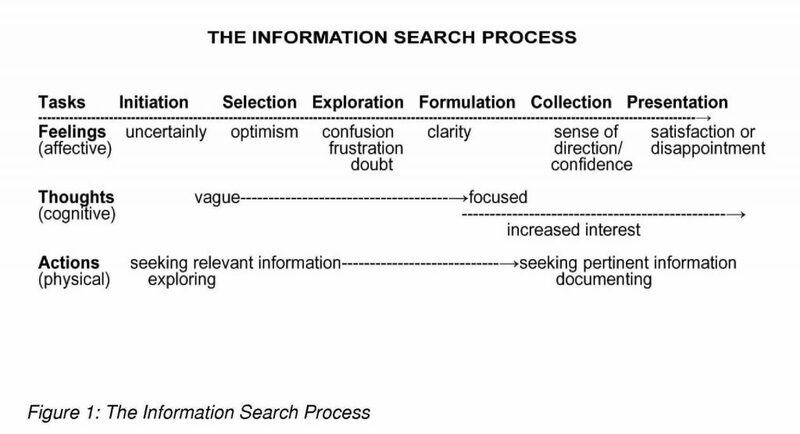 When it comes to research and questioning, Guided Inquiry has become how we think. When our leadership team was tasked with leading professional development for our site, they looked to the Guided Inquiry framework to develop the PD. We have went beyond just using it with our students because we see its universal value. At Lincoln Elementary we give our students a voice, ensure they have choice, and live a growth mindset in order to encourage students to have one as well. 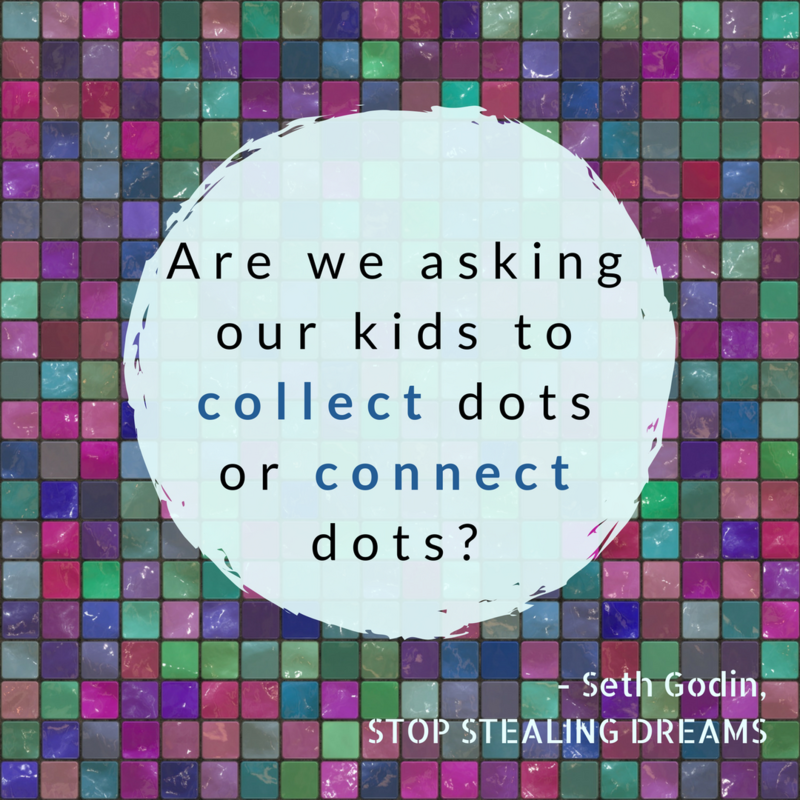 Guided Inquiry has been an invaluable tool to help get us there. 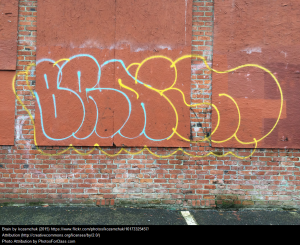 As I alluded to in yesterday’s post, British Columbia has recently introduced a brand new curriculum, which my school started to roll out in the 2015-2016 school year with some pilot units. By the 2016-2017 year, we were expected to be fully teaching the new curriculum. The new curriculum, which can be found here , is quite a bold endeavour. Instead of focusing purely on content, students are instead expected to develop “curricular competencies” across all subjects, with a set of overarching “core competencies” – personal traits such as critical thinking, creativity and social responsibility – that are self-assessed. Each subject has a set of between four and six Big Ideas – the broad understandings that students should gain. Below the Big Ideas are Content – what is being taught – and Curricular Competencies – the skills and attitudes students need to be able to demonstrate. Analysing and discussing our new curriculum could be a whole blog in itself, so suffice it to say that it has caused a lot of reflection, planning and imagination at schools across the province. Overall, I really like it. 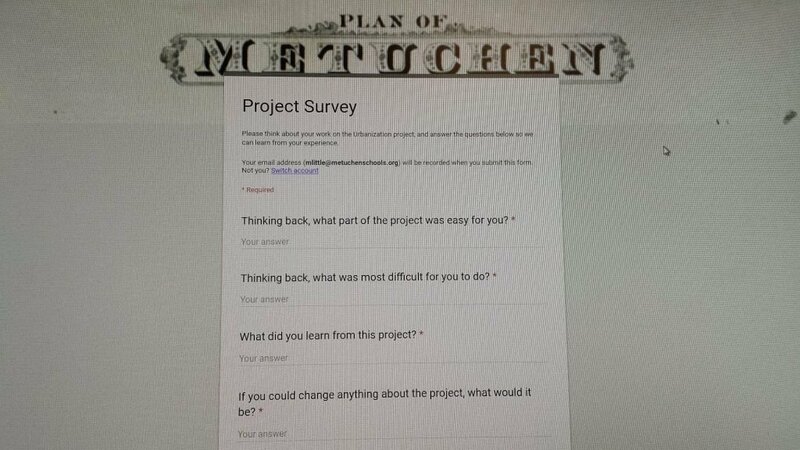 I think it lends itself beautifully to Guided Inquiry Design, cross-curricular learning, and individual interests. There are, however, an awful lot of learning outcomes to be addressed, and much of the wording is vague. Despite the fact that there is less emphasis on content, there have nonetheless been massive changes in the content taught in different subjects. I will get into this more in my next post about our Grade 6 project, but in almost every core subject, our teachers have had to introduce different content to align with the provincial standards. In Grade 4, one new addition to the science curriculum was the Big Idea “All living things sense and respond to their environment” with the content expectations surrounding the five senses. The Grade 4 teachers, Vickie Lau and Guy McAuliffe, met with me and our inquiry based learning teacher, Graeme Webber, to brainstorm some ideas for an interesting unit on the senses – not just in humans, but in other animals as well. As it turned out, we didn’t know a whole lot about how other animals use their senses… how could we make an engaging project so the boys could ask questions, build their knowledge, and showcase their learning in a unique way? The five senses are an interesting topic to think about teaching, because kids know what they are – but how much do they truly understand about the sensory systems of other animals? What organs and structures in animals and humans are responsible for sensing stimuli? What seemed like a pretty straightforward topic actually had many interesting avenues we could take! 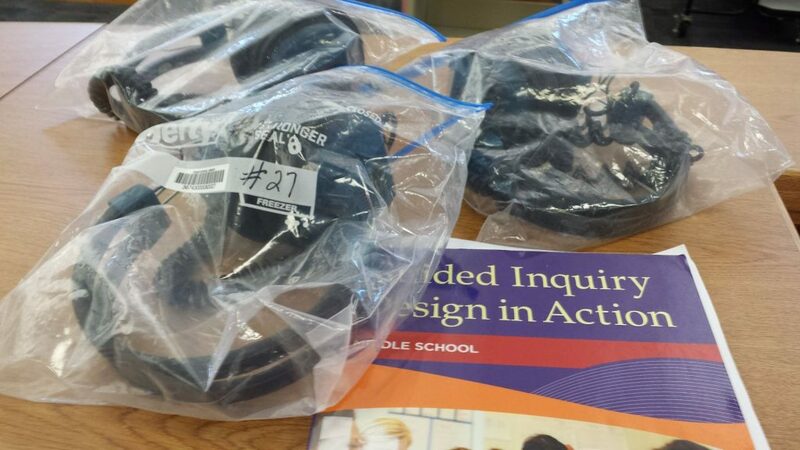 Initially we played with the idea of a full Guided Inquiry unit which would allow each student to explore the senses according to his interests, but we determined that this might be challenging given the timeline, our own teaching schedules, and student abilities. Eventually we came up with the idea of having a weekly mini unit comprised of an Immerse/Explore session for each sense based on our library’s very successful Human Library program. 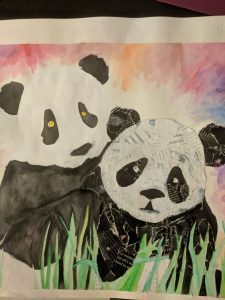 We would invite a guest expert in each week to talk about one particular sense, then give the boys time to journal, ask questions, and later explore a LibGuide about animal senses that I would create. Based on past Human Library events, we had a wonderful supply of guest speakers we could call on. We invited a dog trainer who specializes in scent detection work, our school’s contract vision and hearing consultant, and a marine biologist in to give presentations on smell, sight, hearing and touch respectively. But what about taste? We debated for some time and decided that we could do that ourselves. We set up stations in the library with a salty, sweet and bitter taste tests, and had the boys determine where on their tongues they could identify each flavour. As has come to be expected with any GI unit we do, student engagement was very high. Ann, the dog trainer (and a retired elementary school teacher) set up some experiments to test the boys’ sense of smell compared to that of her dogs. 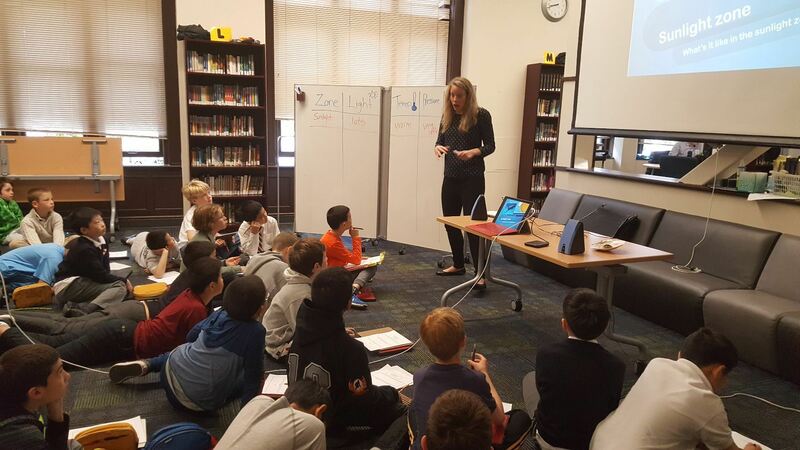 Linda, the hearing and vision expert, demonstrated how technology can help people with vision and hearing deficits, and Melanie, the marine biologist, enchanted the students with how creatures of the deep oceans are able to use touch to find prey. (We teachers also ran a pretty fun taste test!) 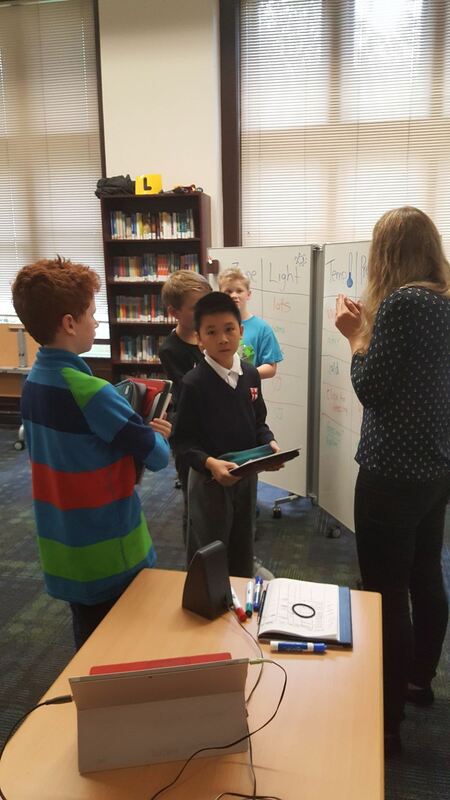 Questions came fast and furiously; the boys recorded lots of ideas from both the presenters and their LibGuide explorations. The depth of understanding went far beyond our expectations. Ann sets up a test of human scenting abilities! Melanie explains the different zones of the ocean. Boys could not wait to ask Melanie more about marine animals. But then an important question came about: how can the students share their new knowledge about the senses? Because we structured this unit as a series of Immerse sessions, each student received the same experience and heard the same information. They all read the same resources on my LibGuide. 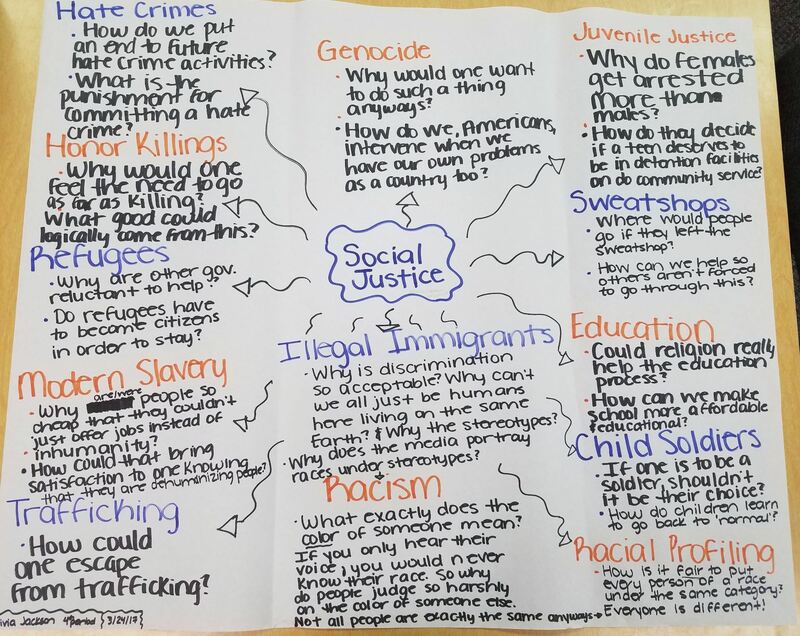 We did not move beyond the Explore stage into identifying individual inquiry questions, so preparing oral reports or posters would be rather tiresome with each student giving the same information. Create an original story or finding an existing story (with permission), sharing the story from memory with others, using vocal expression to clarify the meaning of the text, using non-verbal communication expressively to clarify the meaning, attending to stage presence, differentiating the storyteller’s natural voice from the characters’ voices, presenting the story efficiently, keeping the listener’s interest throughout. This was, so far, not something Guy had been able to cover in his classes, and he had not had any ideas of how to teach it. What if the boys synthesized their understanding of the five senses and turned it into an oral story about an animal they learned about during our sessions? And what if, rather than performing his story live (thereby experiencing potential performance anxiety and squirrelly audiences), each boy videoed himself so that everyone could have a chance to listen and watch? 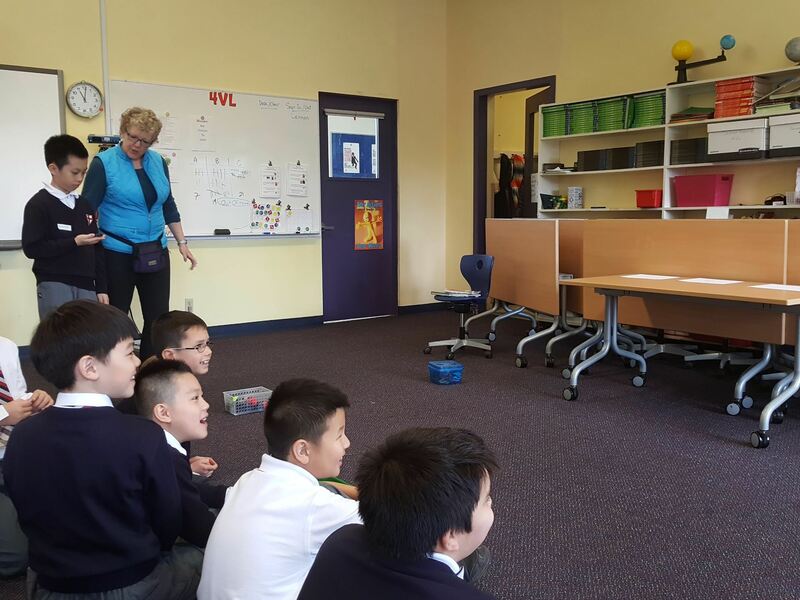 This turned out to be very successful – Guy provided examples and instruction in oral storytelling during L.A. classes and gave the boys time to prepare and practice their stories. 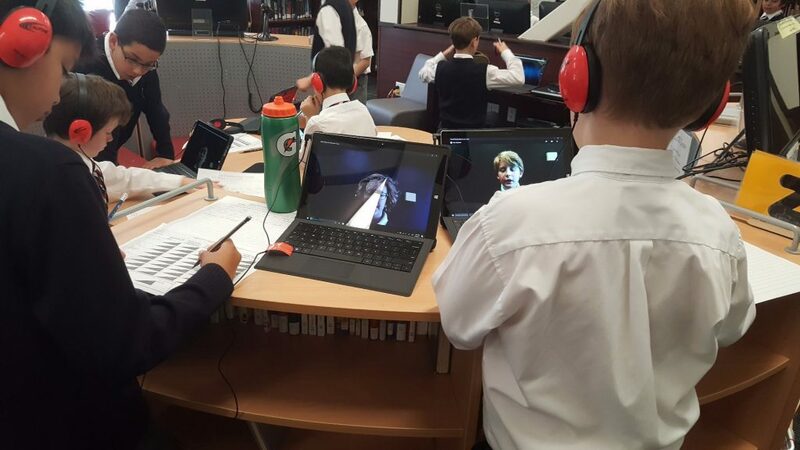 Using their school laptops, each boy filmed his story and saved it. 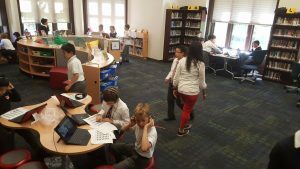 We then hosted a celebratory Share session in the library: each boy brought his laptop, and we spread them out around the space with headphones and evaluation sheets. We gave everyone time to listen to as many of their classmates’ stories as possible. It was a wonderful celebration of their learning and a really unique way to evaluate each others’ understanding of the five senses. 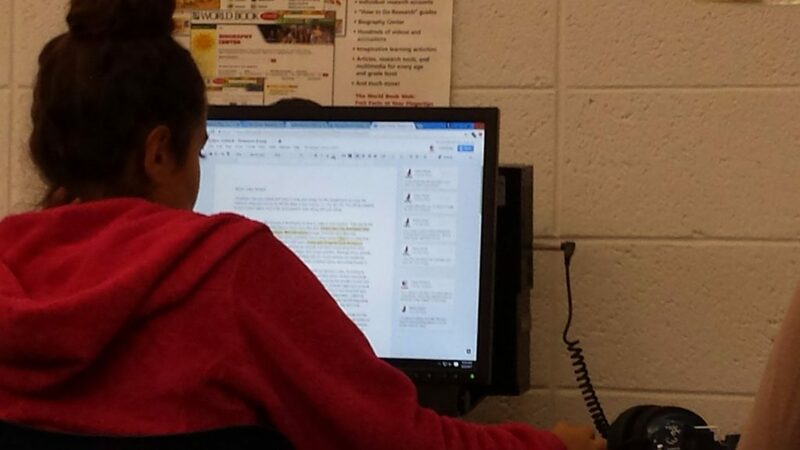 For the Evaluate phase, Guy made a peer evaluation form that was left at each laptop, so students could leave feedback on their classmates’ stories. 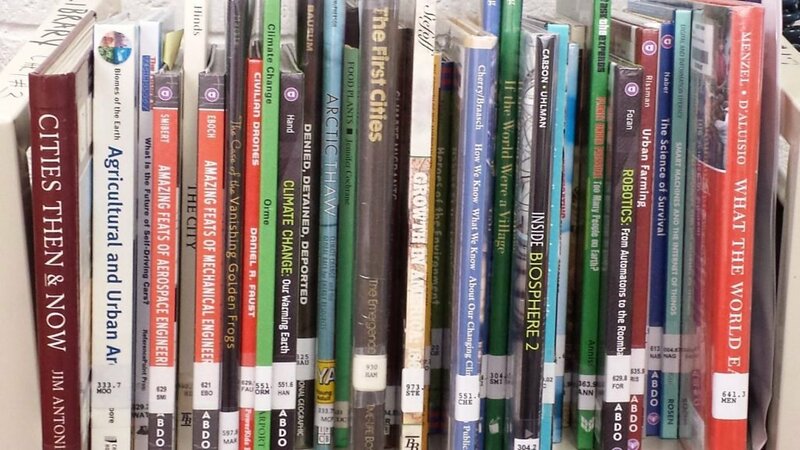 My next and final post will be a look at our Grade 6 Guided Inquiry project – also based on new curriculum, and also leveraging the power of the Human Library! 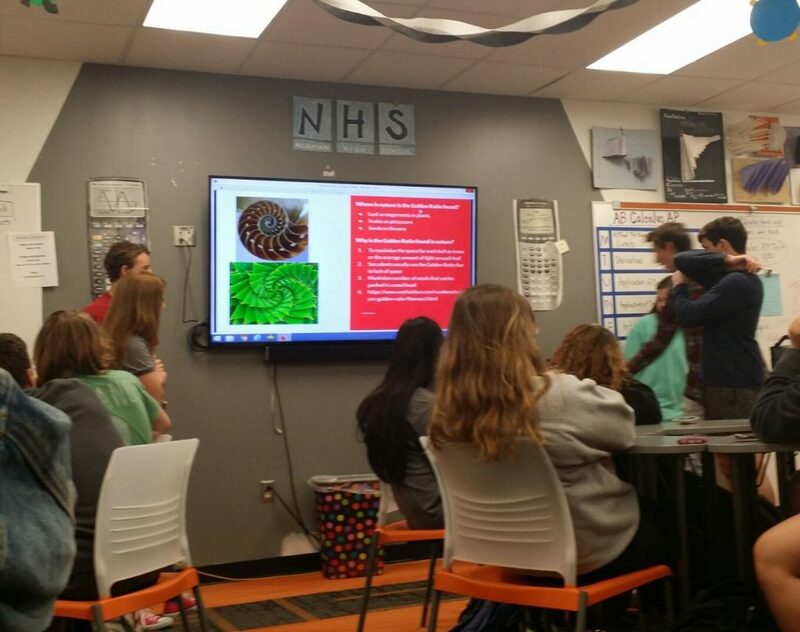 We asked two classes of geometry students, “What do you want in a renovated school library space that will better prepare you for learning in high school and beyond?” After we facilitated student learning through the guided inquiry phases, it was in the Share presentations that we fully heard their answers. Numerous proposals called for a second floor. Students recognized the square footage of our library and the number of classes we accommodate each day often make it a tight fit. While some suggested a top floor to be a lounging area, others wanted to place 30-40 computers up there so the direct instruction space could be in a more isolated location. Same idea with two very different visions for the space. Hearing the rationales behind their choices was very interesting and made for great reflection and discussion. A cafe was another popular recommendation. 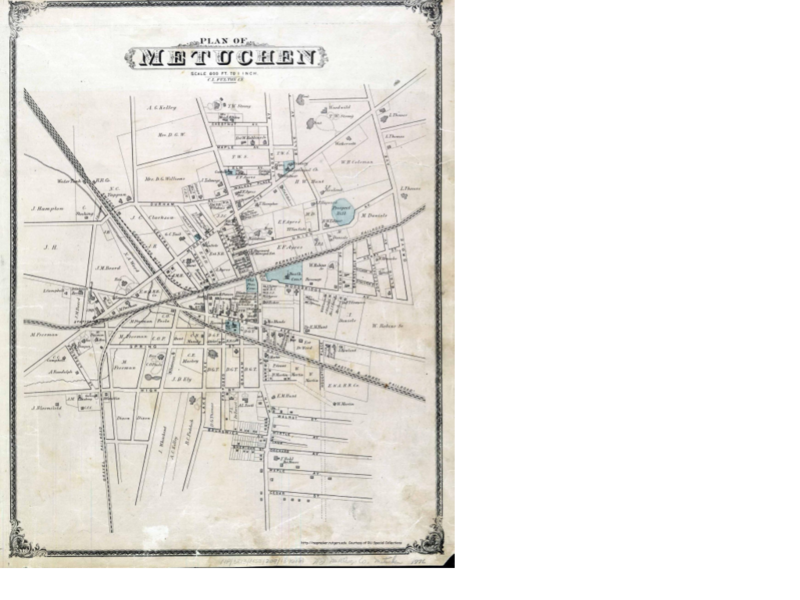 Having a place to purchase coffee, hot chocolate or tea was quite the trend. Students talked about how this could potentially raise more money for library books while helping them stay awake and energized throughout the day. Others wanted the cafe to be a self-serve vending machine so that the librarians wouldn’t have to run the space and yet it would still provide a place for students to get that mid-morning pick-me up. Regardless of how it was operated, students loved the idea of having a new place to relax and socialize throughout the school day. There were very practical proposals too. Those included more durable and modern furniture, tables and chairs on wheels that would be easier to move, a new paint scheme, faster computers, and furniture with electronic device charging stations. The inclusion of whiteboards or whiteboard walls were often mentioned as a more convenient way for groups to work together too. 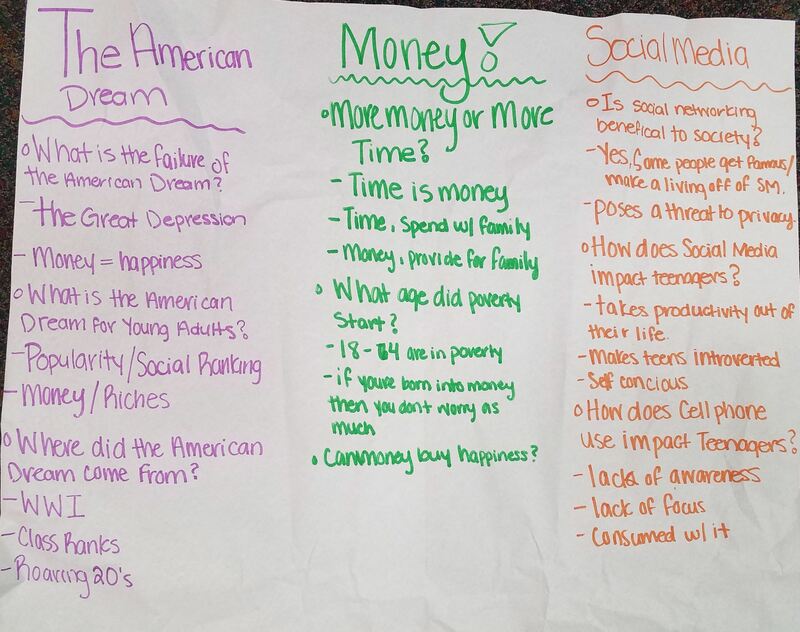 Other students pitched one-of-a-kind ideas. 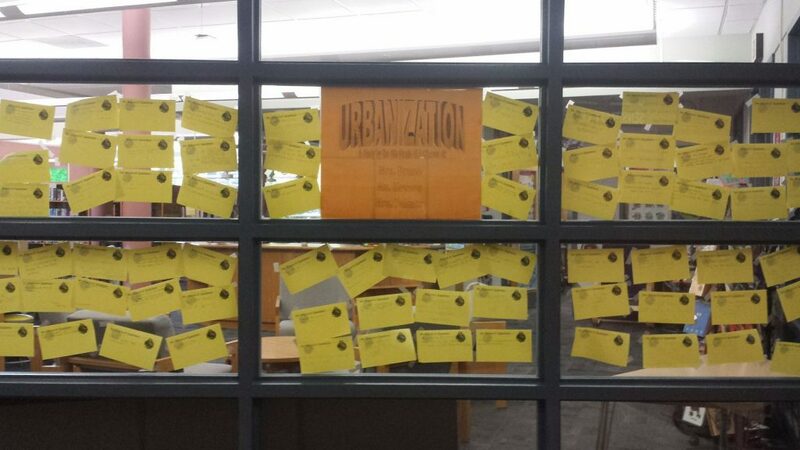 For instance, one student recognized our windowless space could be totally transformed by adding an atrium of sorts. Others wanted to install fish tanks — many, many fish tanks — so that we’d be different than any other school in the area plus have an interactive learning space for science classes. Another idea was to install a state of the art camera system that monitored each library space so librarians wouldn’t have blind spots anymore and took it one step further to suggest having monitor displays throughout the room so everyone could self-police themselves. Another person recommended taking out all the traditional bookshelves and install expandable (electronic) stacks so that we could house MORE library books in a smaller space to make room for other learning areas, including an expanded Makerspace. Who knew this is was what high school students wanted? I wish you could’ve been there to hear these students present their ideas. For the most part, they were professional, positive, and attempted to solve issues that are currently dealt with in the school library. And on top of that, these students applied many of the geometry concepts they had been learning all year in a very real and practical way. It was an authentic project centered on mathematical content. And while I was hoping for a green screen and video equipment area, less bulky circulation desk and/or fitness bikes that would help keep both our minds and bodies healthy, that’s not what the students said. And that’s ok! In the upcoming renovation, it is my hope that we can work with school officials and architects to combine the students’ ideas and what the school librarians prioritize too. And that, I believe, will make our renovated space a truly unique place for our students to learn, collaborate, network, research and create with one another.